The history of American universities is punctuated by shifts in the terms on which the mission of higher education is defined and debated. 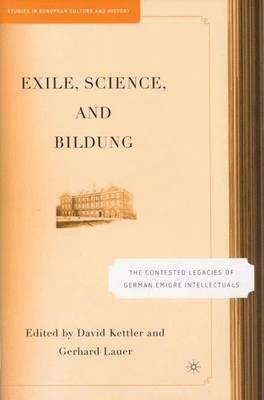 A dramatic moment with lasting effects came with the introduction of German-speaking exile intellectuals in the Hitler era. In Germany, the academic culture of the early twentieth century was torn by the struggle between Wissenschaft and Bildung, two symbolic German terms, whose lack of precise English equivalents is a sign of the different configuration in America. The studies in this book examine the achievements of numerous influential emigre intellectuals against the background of their mediation between the two cultural traditions in science and liberal studies. In showing the richness of reciprocal influences, the book challenges claims about the disruptive influence of exile culture on the American mind. Illustrations note XII, 203 p.
DAVID KETTLER was born in Leipzig and emigrated to the United States in 1940. He is Scholar in Residence at Bard College, USA and Professor Emeritus in Political Studies at Trent University, Canada. A political theorist by training, Kettler is author of several books on Karl Mannheim, most recently Karl Mannheim's Sociology as Political Education (2002: with Colin Loader), as well as studies dealing with Franz L. Neumann and other legal and political thinkers with careers in both Weimar Germany and exile, most recently collected as Social Regimes, Rule of Law, and Democratic Change (2001). GERHARD LAUER is Professor of German at the University of Goettingen, Germany. He focuses his studies in early modern literary history, history of science, German-Jewish History and literary theory.